Forty years ago, the Ronald McDonald House of Cleveland opened its doors, providing a welcoming and supportive place to stay for families whose children receive treatment at area medical centers. Since then, thousands of families have passed through those doors to find comfort and strength for their children. It was a passionate group of parents, medical professionals and friends who worked tirelessly to create this legacy of love, and with gratitude we dedicate this anniversary year to them, and to those who continue to keep their vision going strong. It all began in February of 1978, when pediatric oncologist Dr. Samuel Gross of Rainbow Babies and Children’s Hospital met with a group of parents whose children he was treating to discuss the concept of the Ronald McDonald House. By that November, those and other key parents had organized into a working nucleus and reached a preliminary agreement to purchase the College Motel near Rainbow. The group presented their project plan to McDonald’s owners in Northeast Ohio, who gave them unanimous backing and a $150,000 pledge. Shortly thereafter, the parents formally incorporated a non-profit organization, Children’s Oncology Services of Northeastern Ohio, secured a mortgage and credit line, and took title to the College Motel. Things moved quickly after that. The community soon realized the value of an organization that could provide care to families in a time of need and pitched in with tremendous support. Cleveland Browns player Thom Darden became the first Ronald McDonald House of Cleveland spokesman. Over the next several months fundraisers were held to benefit the organization, including a “Shamrock Shake” promotion at local McDonald’s restaurants, a Cleveland Indians ice cream promotion and a Gym-a-Thon. There was even a donkey basketball game; donkeys were brought into the Orange High School gym, and the Orange and Pepper Pike police departments played against the WGAR and Channel 43 All-Stars. The game raised $1,500, equal to about $5,100 today. Eventually more than $150,000 was raised to make the Ronald McDonald House dream a reality. Meanwhile, work continued on the building as more than 200 parents and friends volunteered and scavenged furnishing and materials for the new House. By September 1979 the building exterior and parking lot were finished and 75 volunteers joined forces to clean the interior. Painters, wallpaper hangers, plumbers and carpet layers applied the final touches and the Ray Kroc Foundation contributed $25,000 to the project. 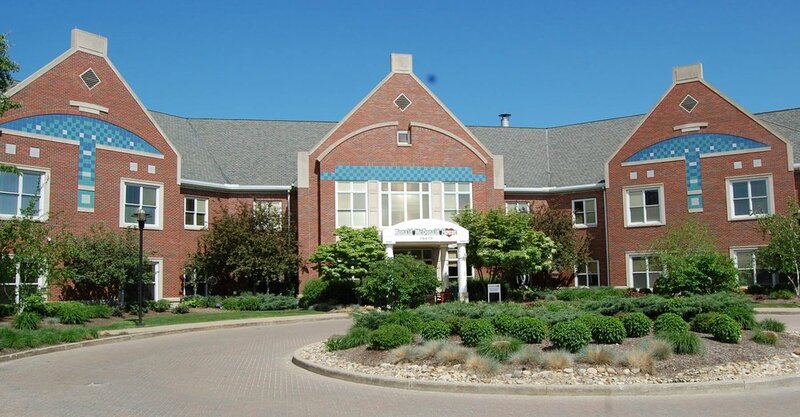 On September 25, 1979, the Ronald McDonald House of Cleveland opened, with rooms to host up to 25 families per night. By the early 1990s, as the Cleveland Clinic and other area hospitals grew, stays at the House were in such demand that the need to expand became apparent. After more than ten years at the original location, an agreement was reached with the Cleveland Clinic for the purchase of a four-acre plot at the corner of Euclid Avenue and E. 105th Street, once a jumping area known as Doan’s Corners. The site had fallen into decay over the decades and the Clinic sold it to the Ronald McDonald House for $1. Funding for construction was secured with the help of Ronald McDonald House Charities, and in the spring of 1994 a new 37-family House was opened at the current location. In 2013, again faced with lengthy waiting lists, the House was fully renovated and a new wing was added, increasing capacity to 55 families per night. Through the years, the Ronald McDonald House of Cleveland has also added innovative services to help more families in times of need. These programs include Ronald McDonald Family Rooms at University Hospitals Rainbow Babies and Children’s, Cleveland Clinic Children’s, Cleveland Clinic Fairview, and MetroHealth Medical Center. RedTreehouse.org, the Ronald McDonald Family Resource Link, connects families to important resources they need throughout the state of Ohio, and the new Ronald McDonald STAR Centers at the UH Rainbow Center for Women and Children and Cleveland Clinic Children’s Outpatient Center provide a fun and welcoming learning environment for children while family members receive focused outpatient care.